The following article is from the Huffington Post; no ownership is claimed over any of this material, it is being posted purely for educational purposes. OAKLAND — Locally-owned businesses along Oakland’s Telegraph Avenue flew green flags outside their storefronts Monday afternoon in solidarity with several hundred protesters outside nearby City Hall speaking out against President Barack Obama’s recent crackdown on medical marijuana. 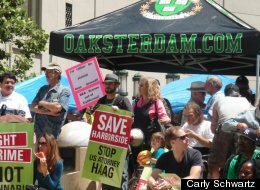 “We are here today to send a message so loud that not even the president will be able to ignore it,” Steve D’Angelo, director of Oakland’s Harborside Health Care, which calls itself the “nation’s largest dispensary,” told the crowd as it erupted into cheers. Obama will swoop through the Bay Area for three fundraisers Monday evening, including a reception at Oakland’s Fox Theatre. And the local cannabis community is determined to make its presence known. Since the Department of Justice began targeting medical marijuana businesses last fall, the East Bay city has been one of the hardest hit. In April, federal agents raided the iconic Oaksterdam University, forcing its owner, Richard Lee, to separate himself from the company he founded. This month, U.S. Attorney Melinda Haag, the face of the Bay Area’s anti-marijuana movement, threatened to seize Harborside and its sister dispensary in San Jose. “You can close down Oaksterdam, you can close down Harborside, and lots of things will happen,” said retired Orange County Superior Court Judge James P. Gray at the rally. “None of them will be good. People will still be getting marijuana, but it will be in illegal manners. California became the first state to legalize marijuana for medicinal purposes when voters passed Proposition 215 in 1996. The industry has since flourished into a major moneymaker for the state, generating more than $100 million in tax revenue each year. That began to change in October, after federal authorities announced they would target medical marijuana operations throughout California, claiming the businesses have ballooned into “numerous drug trafficking enterprises” and citing their proximity to parks and schools. In the past 10 months, hundreds of dispensaries have been forced to close, and thousands of jobs have been lost. The Obama administration’s actions contradict the president’s messages on the campaign trail, where he assured voters he would not use federal resources to go after medical marijuana in states that had legalized it. Parents at Monday’s demonstration said that they weren’t concerned with dispensaries’ locations near parks and schools, and that they wished federal officials would focus their attention elsewhere. Oakland has been plagued by unprecedented gun violence in recent weeks. Other protesters were quick to point to the medical benefits of cannabis. Evelyn Hoch has been caring for her best friend, a victim of stomach cancer, for 23 years. For two decades, her pain medication “turned her into a zombie,” Hoch explained. Then she tried medical marijuana, and was able to cut down on other narcotics by 50 percent. Hoch’s friend isn’t alone — Monday’s demonstration was joined by many activists suffering from terminal illnesses who claim medical marijuana is their best antidote. To see more images from the protest, follow the link at the top of the page to go to the Huffington Post article. Stand together in spirit with Oakland!